These days the holy grail of weeknight dinner is one that is healthy, hearty, packed with flavor, and, most importantly, comes together quickly. A dinner that checks all those boxes and makes great leftovers is a keeper. I first made these BBQ lentils a few weeks ago and they have been making an appearance on the dinner menu every week since. They are adult and toddler approved. French green lentils are quick and easy to cook. Water and lentils go in a pot, boil and simmer, then drain. You can’t mess it up and they cook just long enough for you to get the rest of the meal together in the meantime, and I really mean that. I make this dinner with a 16-month old playing with Tupperware at my feet! I love French green lentils for this dish because they hold their shape better than other lentils and this is a dish where you want some texture (not mush!). Lentils are the star of this dish and besides being deliciously nutty and earthy they offer a fantastic source of clean protein, iron, zinc and folate. The carrots are there to offer the whole supply of beta-carotene (Vitamin A! ), and celery alkalinizes the system. 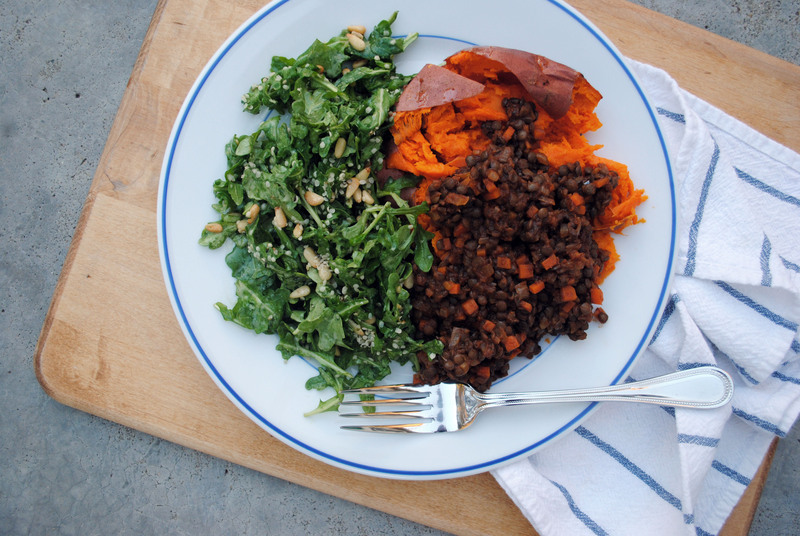 Lately I’ve been serving the lentils over a baked sweet potato with a simple arugula salad for a complete meal, and an extra dose of beta-carotene, fiber, Vitamin C, potassium and calcium from the potato, and immune strengthening powers from the greens. Drizzle a quick sauce of Dijon mustard and maple syrup over the lentils and sweet potato for an extra flavor boost. Leftover lentils are a delicious snack right out of the refrigerator, scooped up with a hearty cracker. Try Mary’s Gone Crackers Super Seed crackers (gluten free). They are our hands down favorite. A quick and satisfying meal for the whole family, these hearty, BBQ lentils can be served over sweet potatoes or on a cracker as a snack. Cook the lentils. First rinse the lentils. Add to small pot with water. Bring to a boil then simmer for approximately 25 minutes or until tender. Drain. Alternatively, follow cooking directions that accompany your lentils. Prepare sauce. Mix BBQ sauce, ketchup, water, Worcestershire sauce, and tamari in a small bowl. Chop and cook vegetables while lentils cook. Cutting the carrots and celery to a ¼ inch dice allows them to cook quickly. Add olive oil to a large sauté pan or skillet and heat over medium heat. Add onion, stir to coat, and cook for 2 minutes. Add carrots and celery and continue to cook until carrots soften and onions are translucent, 3 to 5 minutes. Add cooked lentils and sauce to the vegetables in the pan. Stir to combine and heat through. *Inspired by the vegan BBQ lentils from The First Mess which she serves over a gorgeous millet polenta. *I’ve been making this dish with Hak’s BBQ Sauce Thai Chile Tamarind. The tamarind gives the dish a sweet tanginess that I love, but I’d love to find a great, naturally sweetened BBQ sauce. Let me know in the comments which sauces you love!